canning run on Monday (© Brian Brown/Beer In Big D). Since opening in May of 2015, Tupps Brewery has been working to develop a presence in the market by way of local draft accounts. This month, though, the company looks to extend its reach by offering its beer in cans for the first time. An inaugural canning run took place on Monday at the brewery's facility in McKinney, with equipment provided by Armadillo Mobile Canning. According to Tupps' sales manager Chase Lewis, mobile canning provided the best option for getting packaged beer into the market short term, though Tupps does intend to purchase in-house equipment sometime in the future. "We're still working through the process of obtaining quotes on various canning lines, so for now we're just going to take advantage of the convenience of going mobile." 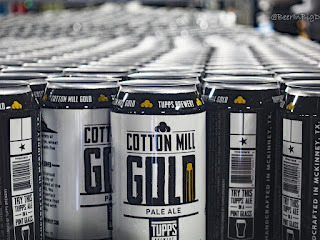 As for distribution, Tupps' marketing and events coordinator Katie Baker indicated that the brewery will continue to self-distribute, with current plans calling for deliveries of canned products to occur all across the Dallas-Fort Worth Metroplex. Initial shipments will begin arriving at retail on Friday, March 18, with cans expected to be available at area locations of Fossil Creek Liquor, Market Street, Spec's, Total Wine and Whole Foods, as well as at other local craft beer retailers (a full list will be posted on the brewery's website). 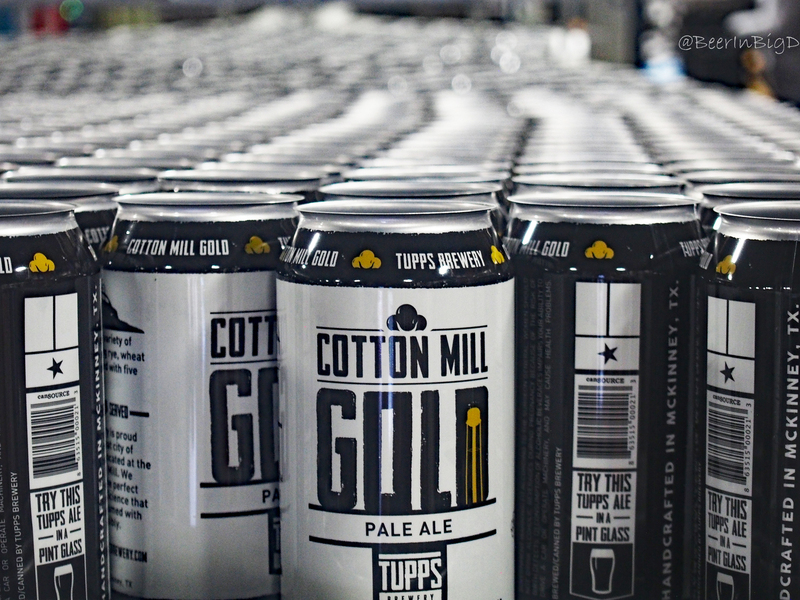 Once on retail shelves, consumers will be able to purchase all five of the brewery's year-round beers, a lineup which includes: Black Ale, Cotton Mill Gold, Northbound 75, Texas Shade and Tupps IPA. Additional offerings will follow, such as McKinney Red Rye Ale, a new beer scheduled for release in April. A full slate of pre-release parties is planned for the week leading up to the official launch event, which will happen on Friday, March 18 at The Rustic in Dallas. See the list below for where and when you'll be able to try Tupps beer in cans for the first time, and be sure to follow the brewery on social media for the most up-to-date details. Monday, March 14: The Celt, McKinney - featuring a pre-release of Tupps IPA. Tuesday, March 15: The Bearded Monk, Denton - featuring a pre-release of Northbound 75. Wednesday, March 16: World of Beer, Plano - featuring a pre-release of Black Ale. Thursday, March 17: San Francisco Rose, Dallas - featuring a pre-release of Cotton Mill Gold. Friday, March 18: The Rustic, Dallas - Official Can Launch Party featuring the complete Tupps lineup in cans. Sunday, March 20: Barcadia, Dallas - featuring a pre-release of Texas Shade.